The Museum in the Park07973 559981 work MuseumThe trademark Penny Farthing bicycle entices visitors to explore the treasures of this compact museum. Housed over two floors of the former Park Keepers Lodge, the exhibits are wide ranging. The replica waistcoat of the Fat Man of Maldon, which accommodated 7 men, is one of the more unusual items featured in the collection. Charting the social history of the town over the last two hundred years, displays include old Maldon shop fronts, a Victorian parlour and the history of the railways. Each year a new display is launched relating to a topical subject or special anniversary. The trademark Penny Farthing bicycle entices visitors to explore the treasures of this compact museum. Housed over two floors of the former Park Keepers Lodge, the exhibits are wide ranging. The replica waistcoat of the Fat Man of Maldon, which accommodated 7 men, is one of the more unusual items featured in the collection. Charting the social history of the town over the last two hundred years, displays include old Maldon shop fronts, a Victorian parlour and the history of the railways. Each year a new display is launched relating to a topical subject or special anniversary. 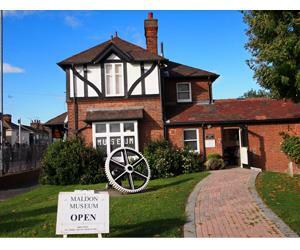 The museum is situated within the Promenade Park, Maldon where there are baby changing facilities, public and disabled toilets, catering and picnic site. There has been a new audiovisual system installed. 'The Museum in the Park' - Opening Times: Wednesday, Friday and Saturday from 2-5pm. Sunday and Bank Holiday from 11 - 5pm. Children up to 15 admitted free during school holidays. Are open from end March to beginning November. Proceed down Maldon High Street into Mill Road. Park gates are on the left after passing half timbered Museum building. Disabled parking found just within gates. 200m from Museum.